Application of Brazil Mata Viva Program conducts the measurement of your inventory through a unit of measurement, the UCS. The UCS guarantees and certifies the credit right under the intangible asset intangible. For this tool, companies can participate in the preservation and protection of environmental heritage performing the compensation of the impact of its production activities, with interesting earnings. - This CPR is a clear and certain title representative of delivery promise of rural products established by law in 8929/94. This CPR is recorded in the CETIP, which is Central of Custody and Financial Settlement of Securities, currently CETIP SA - Organized Markets - Product offeror and registration, custody, trading and settlement of assets and securities . - The rights of UCS are transferred to undertakings by Rights Assignment Agreement . The buyer, by acquiring a forest credits, employing them as compensation of project environmental impact of its activities, the accounting credit of fair value (face value) as a cost or expense for the Sustainability Project your interest. This way may deduct such amount of IR tax basis and social contributions. The difference (checked from the tax assessment) of the IR tax basis allows the company can finance its offset project which calls for forest protection. Moreover the company may also acquire the Credit forest in order to be the distribution agent along your supply chain and network of partnerships, earning income for the transfer of credit right. Financial institutions can use credit as forest products, sending Agribusiness Credit Bills (LCA) under its credit right. Credit Forest is a very intangible nature that serves as a response and solution to the consumption of water, energy, fuel and wood as well as the emission of greenhouse gases, waste generation, etc. To be directed to restoration, maintenance and preservation of forests, as well as the adequacy of production processes in the field, this "intangible" can be used as "guarantor mechanism" of spare reserves of biological inputs and as "mitigating mechanism" the effects of the impact of their activities. Certificates enable trade in environmental services and products market between Environmental Service Providers and Enterprises and creates the conditions for it to be attractive to companies that invest in environmental offset the impact of their activities. 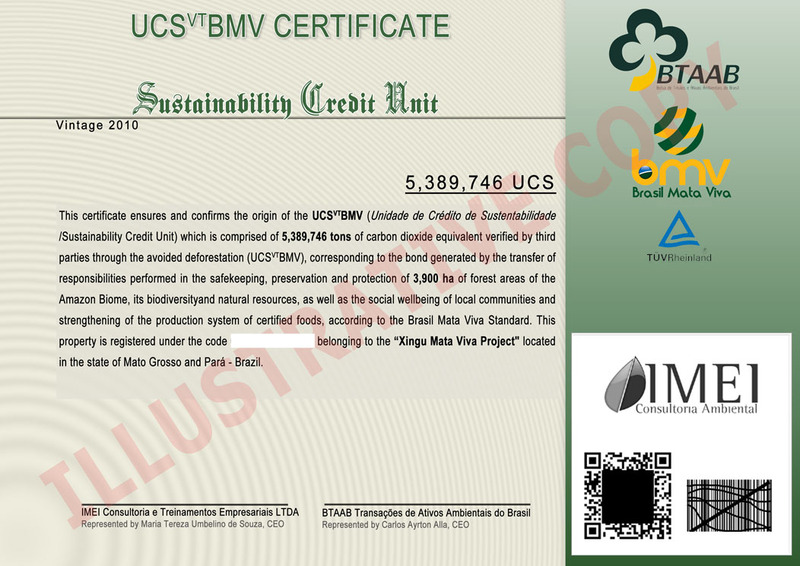 From the moment these certificates are assessed, accredited, verified and recorded in international credibility entities become Titles Sustainability, with all the features of such an order assets. Thus, they can be traded or offered as collateral. the active zero registration / issuance of CPR (Rural Product Certificate) that records the undertaking by the producer to preserve certain area: Regional Registries. The areas are monitored via satellite on a regular basis, and any hint of change, is Rescanned.